How I Used To See Autism – Hi Blog! I'm Dad. Sometimes when I write about the early days of my son’s Autism, the emotions I remember can be surprising. They’re not only raw, but mostly based on fear and confusion. In many ways, they stand in stark contrast to how I see things today. It wouldn’t be fair to portray them any other way in hindsight. Sure, it would make me feel better to be able to say, “On day one, I knew everything was going to turn out just fine.” However, that wouldn’t be true to me or anyone who reads this. The whole reason I share these emotions is to be real, even if it makes me look or feel bad about past points of view. 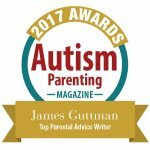 The truth is that it was shocking to me, as a new parent to a child with Autism, when I first began to meet teachers and professionals. Everyone was so upbeat. They all seemed to have an excitement for the future that, to parents during those initial months, may feel like bizarro world. You’re busy burning from the inside out with worry for your child while a smiling woman with a loose-leaf binder cheerily tells you about verbal exercises you can do at home. If my wife seemed like she might cry, this happy binder lady wouldn’t miss a beat. With two fingers, she’d slide a tissue box across the table as she continued her optimistic game plan without stumbling over a single word. During those days, there were many people with binders and many sliding tissue boxes. It was like being thrown into the deep end of the pool. After so many doubts and maybes, I was now staring face to face with the present certainty. Even then, I truly believed there was some sort of mistake. I felt like I was in the wrong place and soon everyone would know. But, just like the bypass, that was where I was supposed to be. It was where Lucas was meant to go and it was what our lives were about to become. I guess that’s the main feeling I had. When I think about how I used to view Autism, it wasn’t so much that my opinion was negative. While I definitely was fearful of it, I couldn’t cite a reason for fearing Autism other than the fact that so many other people in the world seem to be. I guess my biggest feeling was that it was a fine life, but it just wasn’t going to be our lives. My concern, as insane as it was, was that maybe by accepting it, I was pushing him towards a future that wasn’t his. I was convinced of it. Yet denying something doesn’t make it not true. Sure, I had been able to tell myself that this was all just a temporary setback in his development , but no one else was saying it and time was marching on. Everyone we met would talk openly about this situation that we had all been mostly sitting in silence about for months. Before then, “Autism” was a word that was whispered in my brain. Now I was standing before people who were screaming it from the rooftops. And as that screaming continued, it started to become realer and realer. I tried taking him for hearing tests and tricking myself into thinking he may have said a word. None of that mattered, though. What’s true is true. Eventually it all comes out. The real truth of it all is something that I have been slowly learning through the years. It’s what separates Autism awareness from Autism acceptance. It’s the difference from the early days to now. Back then, I thought that having Autism was keeping my son from being the person he was supposed to be. Today I realize that having Autism is the person he is. That’s why many parents of children on the spectrum say that, if they had a magic wand, they wouldn’t want to change their child. I wouldn’t either. I know that sounds crazy to some, but I wouldn’t. Sure I would love it if he would naturally learn the skills he might be missing or come to understand so much of what we tell him over time. That would be wonderful. Magically transforming him into someone else would not. His quirks and personality are all wrapped around his struggles and victories. The ways we interact and the non-verbal language we’ve developed through the years are things that, while seemingly tragic to someone who doesn’t live in our house, are beautiful in ours. His Autism has helped to create a bond unlike any other I’ve known. I’m aware that Lucas has Autism. I see how he might repeatedly start a video on the iPad in order to hear a sound effect repeat. I know he will sometimes cry out of frustration. I get it. I’m not angry at him for it and that’s my Autism awareness. However, I also accept that Lucas has Autism. I’m not trying to find angles out of it or lying about reality. There’s no worry that he should be a different person right now and I need to “fix” anything. I’m just as proud of him as I am of his sister – no more, no less. He’s my boy. That’s the acceptance. It took a while but my life truly changed when I realized that Autism isn’t an ailment. I now know that this is who he is. There isn’t some hidden person hiding inside of him being held back by it. He’s the person inside. And he’s loved. Previous New Year. Same Me.